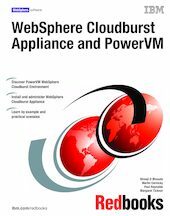 This IBM® Redbooks® publication discusses the concepts and implementation of PowerVM™ and the WebSphere® CloudBurst™ appliance. This book is aimed at administrators and developers who have little knowledge of PowerVM, but in-depth knowledge of WebSphere software. Cloud computing is the pooling of computing resources to provide a single source of computing power to multiple users. A cloud manager provides a self-service portal that maintains permissions and information about cloud objects such as virtual images, patterns, and resources. The WebSphere CloudBurst Appliance represents a cloud manager. It is a secure hardware appliance that optimizes the configuration, deployment, and management of WebSphere Application Server environments in a cloud. It can also be used by service providers providing hosted public clouds and software-as-a-service environments to simplify and standardize repeated deployments of their software. This book includes an introduction to cloud computing and how the WebSphere CloudBurst appliance fits into business today. It presents the features and benefits of using the WebSphere CloudBurst Appliance and the advantages of using PowerVM. It provides the steps required to implement WebSphere CloudBurst appliance with PowerVM.